Writer’s block is caused by one of three things. 1. You are trying to be perfect. 2. You are under pressure to produce the finished product too fast. 3. You have been sitting down too much. Laurie Halse Anderson is the New York Times-bestselling author who writes for kids of all ages. Known for tackling tough subjects with humor and sensitivity, her work has earned numerous ALA and state awards. Two of her books, Speak and Chains , were National Book Award finalists. Mother of four and wife of one, Laurie lives in Northern New York, where she likes to watch the snow fall as she writes. You can follow her adventures on Twitter, and on her blog. Can you imagine being awarded the “best writer in the state”? You were back in the day. A fluent poetry writing machine. This caged bird was born to sing. She wished it was lighter. It made her a fighter. She has paid her dues. All God’s Children Need Traveling Shoes. She loved to write but also dance. Whenever she got a chance. She has no problem sharing her plight. Gather Together in My Name. 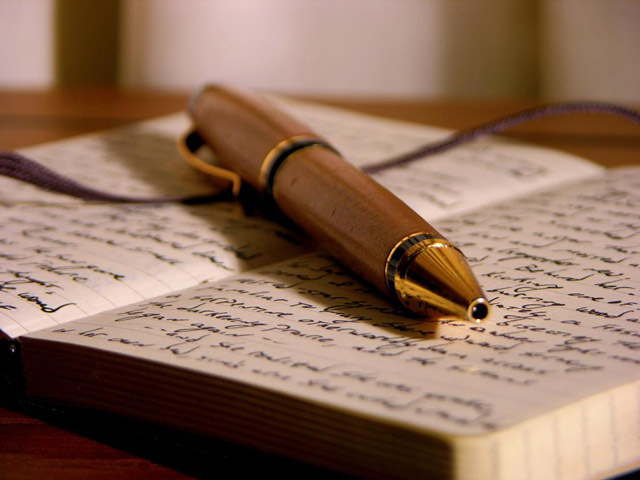 Writing can be one of the most rewarding and fulfilling experiences of your life. There are many reasons a person decides to write: to share their life’s experiences, to tell a good story, to express the feelings and situations of others … the list is endless. Some people even write just for fun. I wrote my book because I visited Egypt with my two nephews and wanted to write a short story to help them remember a special time. To my surprise, the short story turned into a book, and then a book series. So, you never know what’s going to happen once you begin! Any good story is composed of a really gripping plot and realistic, believable characters. What comes first? Everyone has their own ideas but I believe the plot should come first. What’s the point of great characters if they sit around and don’t achieve very much. So, step one, write your plot down in a few words (that’s all you need). “My story is about … who manages to … and goes on to ….” Example from my book: two cousins go to Egypt with their aunt Isabel and their Gran and are given an ancient scarab that plunges them into a whirlpool of exciting events. I have my two main characters, two secondary characters, a great location (open to all kinds of amazing events), an important object, and … well, the amazing events are up to my imagination. How To Choose a Great Story Topic. You may think, “But what can I write about?” Write about what you know best, or what excites you, or what you enjoy. You’ll find that when you are really keen on something—it can be an activity, a place, an event, or a person (real or imaginary)—it becomes easier to write. Do you love reading about faraway exciting places? Then research a place you find interesting and set your story there. Do you enjoy mysteries? Think about something that’ll keep people guessing. Are you good at a skill or a sport? Set your story around a character with those abilities. Make Your Characters as Interesting as Possible. Tip: take them from real life examples. You could write about someone like yourself, or else model the characters on friends at school, teachers, or other people you know. The dialogue between your characters is also important because that’s one place to develop the plot line. Their interaction will reveal the chain of events as the characters work out various situations. Make your information to the reader as interesting as possible by weaving it into the story. Don’t say that it’s cold. Get your character to shiver because he left his jacket at home. You can set the scene around your characters by using adjectives and adverbs to enhance your descriptions and actions but don’t overdo it. The reader is also going to use his or her imagination, so don’t overload your writing with too many descriptions. I can’t remember NOT having a book in my hand. My schoolmates called me a bookworm, and nothing’s changed since then. I was brought up on the children’s classics because my parents are also avid readers. My earliest story-telling talents came to the fore when, from the age of ten, I entertained my three younger brothers and their friends with serialised tales of children undertaking dangerous and exciting exploits, which they survived through courage and ingenuity. Haunted houses, vampires, and skeletons leaping out of coffins were hot favorites in the cast of characters. We also acted out the stories for my long-suffering parents! I graduated from the University of Natal, Durban, South Africa, with a double first in my B.A. (French & Drama). After completing my Honors in Drama at Natal, I then went to the University of the Witwatersrand to do my Masters degree in French-African literature. I also studied drama at The Drama Studio in London and mime at L’Ecole Jacques le Coq in Paris. Upon my return to South Africa, I immersed myself in teaching drama at community centres, and became involved in producing community and grassroots theatre with local playwrights and performers in Natal for several years. A move to Johannesburg took me in a new direction—that of journalism. I have written freelance for the last fifteen years on everything from serial killers to relationship advice. Writing a children’s book—The Secret of the Sacred Scarab—was an unexpected step, inspired by a recent trip to Egypt. The tale of the sacred scarab began life as a little anecdotal tale for my 2 nephews (then 10 and 12), who had accompanied me on the Egyptian trip. This short story grew into a children’s book, the first in the adventure series, Chronicles of the Stone. I’m already immersed in the next book in the series—The Search for the Stone of Excalibur—a huge treat for young King Arthur fans. Although I do not have children of my own, I have an adopted teenage foster child, from an underprivileged background who is just discovering the joys of reading for pleasure. My interests include literature, art, theatre, collecting antiques, animals, music, and films. A thrilling adventure for two young boys, whose fun trip to Egypt turns into a dangerously exciting quest to uncover an ancient and mysterious secret. A 5000-year-old mystery comes to life when a scruffy peddler gives Adam and Justin Sinclair an old Egyptian scarab on their very first day in Egypt. Justin and Adam embark upon the adventure of a lifetime, taking them down the Nile and across the harsh desert in their search for the legendary tomb of the Scarab King, an ancient Egyptian ruler. With just their wits, courage, and each other, the boys manage to survive … only to find that the end of one journey is the beginning of another! Does Egypt interest you? Here, Fiona Ingram shares some great resources for you to check out. Perhaps your NaNo novel might head towards the rising pyramids? Some interesting books on Egypt to inspire thoughts of adventure and amazing events! All available on Amazon. Join Emily Sands’ expedition to find the lost tomb of Osiris. A jeweled amulet glows on the cover, inside the book, there are fold-out maps, postcards, drawings and photographs, ticket stubs, mummy cloth, a scrap of papyrus. (Activity book) And, don’t miss the hieroglyphs writing kit from the desk of Emily Sands: Egyptology Code-Writing Kit. What’s NaNo? No, not the next dance craze you’ll see on Dancing with the Stars or the up-and-coming sound you’ll hear on Glee! NaNoWriMo is National Novel Writers Month and runs from November 1-30 every year. Thousands share in this crazy experience of writing a complete novel – start to finish in only 30 days. How? Lots of caffeine, support and of course a good story idea! No, better than that, a solid outline of your plot, developed characters and plenty of descriptive scenery to beef up your word count. The rules? Pretty simple, really. Sign up on line – it’s free, though they do appreciate donations to keep their massive server running, their volunteers pumped with caffeinated beverages and I’m guessing they have a heck of an electric bill. Browse around the site, get to know others in the chat rooms and forums. Then, TELL EVERYONE you know that you will be writing a novel in November. Will it become published? Maybe, someday. But the goal of NaNoWriMo is to say you’re going to do this and follow through. The catch: No revising! That’s right chickadees, no cross-outs, spell check, or rewriting one scene until it melts from your page like butter. If you did this, you would not complete a first draft in only 30 days. December is for Revising! I’m teaching Super Saturday classes again, this fall. Yep, the good people at Friends of the Gifted and Talented have invited me back to teach my two classes: Young Writers Workshop and Publish Me! Wanna join us? Check out FroG’s site for full details and to register. But hurry – space is limited and my classes fill up quickly.